When the economy faces a downturn, one of the easy things to cut is travel and conference attendance. For people that sell services to conference attendees, the smart decision is to actually increase frequency of attendance, but for those that consume services, the bottom-line focus tends to cause fewer attendees. Equip every speaker with a microphone (yes, even the small sessions), plug a digital recording device into the sound board, and capture everything as a MP3. This can be easily accomplished with very inexpensive hardware that will capture and encode on the fly. Once you have the audio, post it on your site for attendees to download (even better, post it for everyone to download so that they can see the value of content at your conferences -- you are providing fresh and valuable content every time, aren't you?). Total cost of this is whatever the recording devices cost you, some server space, some additional bandwidth, and maybe the rental of a few extra sound boards and microphones during the conference. Of course, this is a sponsorable vector, and you could probably invest in some solid equipment in year one using sponsorship dollars and still have some revenue left over. Give people access to the presentations. This doesn't cost anything and you can use a service like SlideShare (I like SlideShare because you can view the presentation on the web and also download it) to do everything for you; you just have to make sure that you get digital copies of everyones' presentation. If you don't use SlideShare or something similar, you can just put the slideshow files right next to the MP3 files on your site. Providing slides costs even less than the MP3s because the presenters are creating the presentations and all you are doing is uploading them somewhere and making them available for download. Again, this is a sponsorable vector (though it's likely that the same sponsor would want to own MP3s and slides under the same sponsorship). 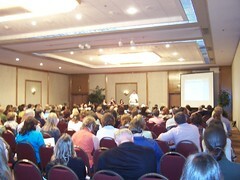 Do a video recording of the presentations and make the videos available to stream from your site. People are used to YouTube-quality recordings, which can be created with very inexpensive digital video cameras. So you invest in some cheap, moderate quality cameras and get the interns to run them during the presentation. I would think in the first year you just upload them to YouTube and embed them on your own site so that you can wrap them in sponsor branding; sure, they'll be available to the world, but you're proving the value of your conferences, so who cares? Again, this is very low cost proposition: just a few cameras and tripods, some interns to run them, and a computer to upload to a service provider. And again, this is a sponsorable vector, so you should be able to get the first year sponsorship to pay for all the hardware and still have a little profit left over. Let's say you do some combination of the above options -- you've now made the registration fee for your conference more cost effective and you've created sponsorship opportunities that did not previously exist. You could get more creative by loading up all the MP3s on to a cheap MP3 player (think SanDisk) or thumb drive and sell the audio; you could load up all the videos and sell them in much the same way (I probably don't need to say it again, but I will: distribution on a physical product is another sponsorable vector that is easily argued to be separate and different from the online distribution side). Perhaps you get even more creative and have one registration fee that only gets you into the conference and another more expensive fee that gets you into the conference and also gets you access to all the digital content after the conference: now you've created an incremental revenue stream along with the additional sponsorable items. PS -- I'm not sure that "sponsorable" is a word (spell check doesn't like it), but it should be as it describes perfectly anything for which a sponsorship can be sold.